Do you have a friend or loved one who is sick with a cold, flu or other medical malady? While you might not be able to provide medical care directly, you can still help with healing by giving a get well gift. Even a small, simple gift can help brighten spirits and set the recipient on the road to recovery. 11.4 When Should I Deliver the Gift? Even a mild cold can really put the brakes on life. 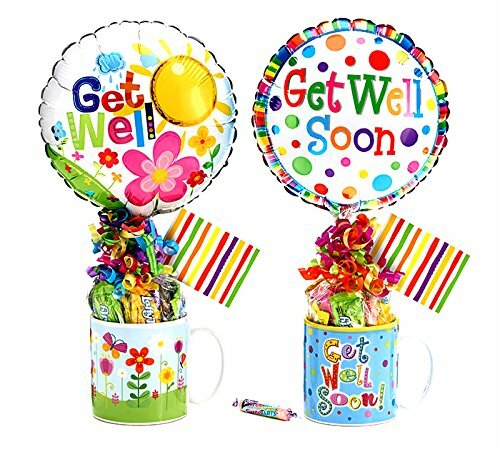 If your friend has been slowed down due to an illness or an accident, give them this fun two-piece gift set. The plush sloth is soft, cuddly and holds a felt heart. 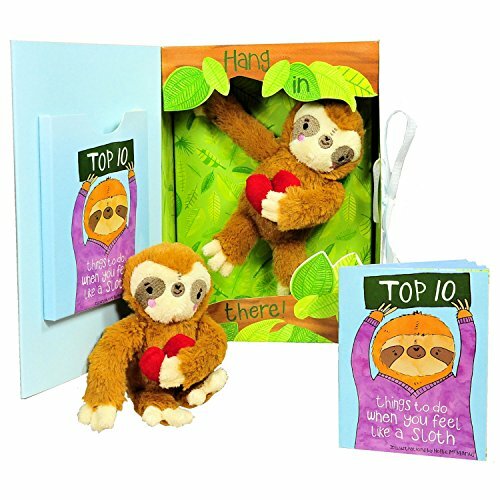 Aside from the charming stuffed toy, this gift set also includes “The Top 10 Things to Do When You Feel Like a Sloth.” This full-color booklet features hilarious illustrations by artist Hollie McManus. Both the stuffed animal and book are sure to make anyone smile. Why settle on just one item when you can surprise your friend with an entire box of goodies. 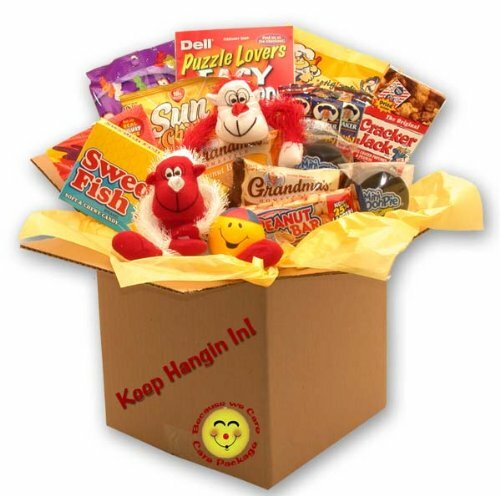 This “Hang in There” care package is filled with tasty treats and fun diversions including a crossword puzzle, moon pies, cookies, chips, a stress ball and more. Everything is packaged in a cheerful box with the phrase “Hang in There” printed on the side. You also have the option to create a personalized message. A great way to deliver comfort food and fun games. This little guy is the perfect friend for anyone with a broken leg. 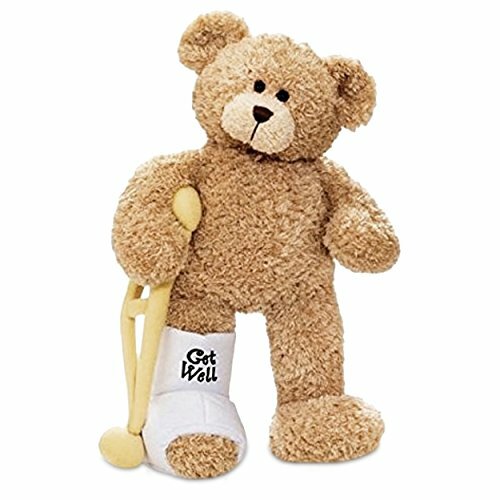 Gund’s Break a Leg Teddy Bear is an eight-and-a-half brown stuffed bear with a little crutch and cast for his “broken” leg. Plus, the cast fits on either leg and can even be signed with an included marker. The teddy bear is a great gift for kids adjusting to a cast of their own. They can see how the cast fits around the leg, while also learning that the cast is only used for a short period of time. The Break a Leg Bear is a perfect little buddy to hang out with during recovery. This 12-inch doll is a classic stress reliever and fun novelty. The doll is made from tough but soft material which can take a beating. Whenever you’re stressed, you can bang the doll against a desk, twist it, toss it and more. The Dammit Doll is meant to be a light-hearted toy perfect for a laugh around the office. 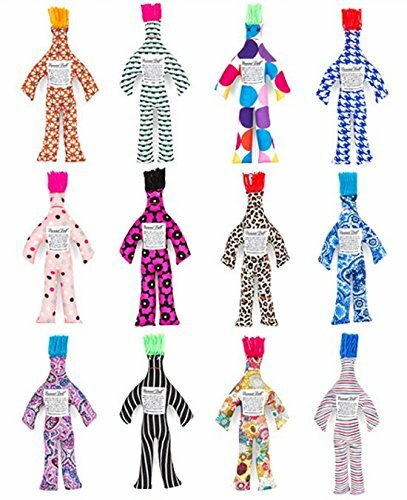 Each doll is handmade and is available in a variety of different colors. While the ability to actually relieve stress is a bit debatable, the doll is sure to raise the spirits of anyone undergoing a stressful time. 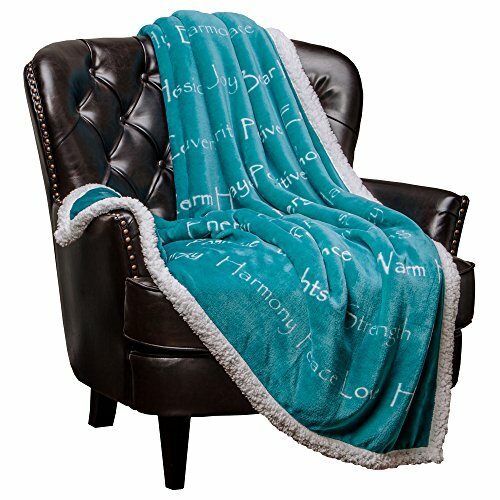 The blanket is made from 100% microfiber polyester. Total size is 65 inches by 50 inches. Perfect for sitting in bed, on the couch or even for use during chemotherapy. Each blanket is backed by a 100% satisfaction guarantee from the manufacturer. Perfect for anyone looking for a simple and fun way to pass the time during recovery. 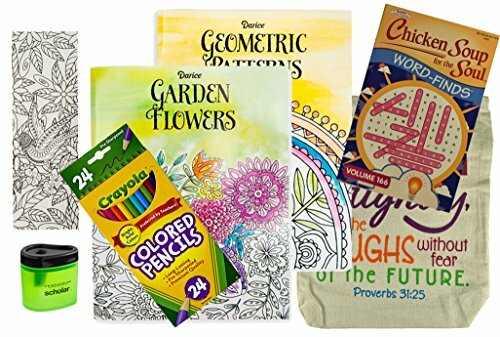 This seven-piece gift set from Multiple includes 24 colored pencils, a sharpener and two adult coloring books (“adult” meaning the designs are complex, not risqué.) Also includes Chicken Soup for the Soul Word Find. The entire gift set is packaged in a tote bag decorated with an inspirational message from Proverbs 31:25. The coloring books and word finds are fun diversions which aren’t excessively taxing on the brain. They’re great for anyone who needs to rest and relax (and who might be under the influence of serious cold medication). Although the gift set is marketed towards women, the items aren’t particularly geared towards any specific gender. When you can’t provide a hug in-person, send this bear hug instead. This novelty paper pouch from The Nuttery NY is filled to the brim with gummy bears. 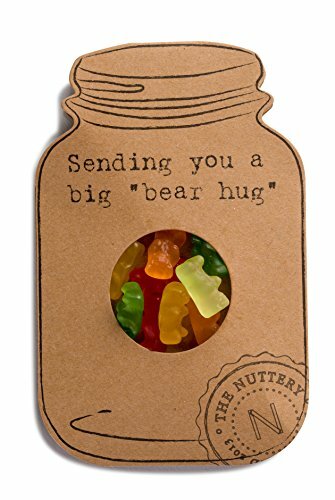 Plus, the phrase “Send You a Big ‘Bear Hug’” is written across the front of the package. Containing about five different flavors, these fun gummy bears are sure to deliver plenty of smiles. Plus, this gift is compact and easily mailed. Perfect for sending to a sick acquaintance or anyone else whose personal interests might not be known to you. After all, everyone loves gummy bears. This tasty basket of treats delivers “First Aid Candy Care” STAT. 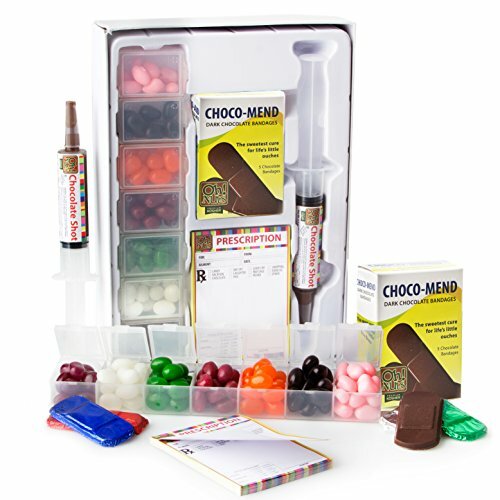 Filled with candies inspired by actual items you’d find in the hospital such as a Chocolate Syringe, Chocolate Bandages and a Jelly Bean Pill Dispenser. The entire gift set is sealed in a box shaped like a medicine cabinet. This set helps make the hospital a sweeter place. Perfect for anyone undergoing a long hospital stay. Also makes a great thank you gift for doctors, nurses and hospital staff. Check out this happy guy! 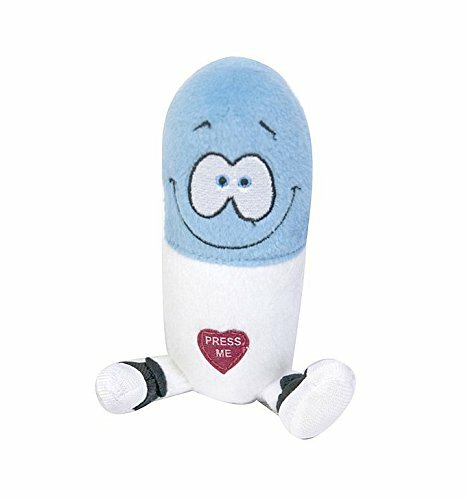 These plush toys are shaped like pills and have a slightly screwy expression sure to bring a smile to both kids and adults. Plus, squeezing the pill makes him laugh, and that laughter is sure to be (the good kind of) contagious. At six inches tall, this pill is safe for children ages three and up. Operates on batteries. Available in many different colors, although unfortunately you can’t order any color specifically. Still, this is a fun, happy little toy perfect for anyone in need of a pick-me-up. After the candy and balloon are gone, the recipient gets a high-quality ceramic mug which they can use as long as they like. Each time they drink from the mug, they’ll be reminded of your thoughtful gift. The mug is both dishwasher and microwave safe. When someone you know falls ill, you might be a bit confused about how to help. People who are currently dealing with an injury, illness or another health issue typically need lots of peace and quiet. You probably don’t want to just stop by and hang out. Instead, sending a gift is a great way to let that person know you’re thinking about them, but still giving them plenty of space for recovery. If the recipient is a close friend or loved one, you’ll often be able to send them a gift personalized to their interests. When shopping for a co-worker, you might have to purchase a slightly more generic gift. Illnesses can be minor and temporary or prolonged and severe. When selecting a gift for someone with a temporary issue, you can generally choose something a bit more humorous and irreverent. However, if the person has a serious issue where recovery is unknown, you probably want to tread a bit more lightly. Generally, when dealing with major medical problems, avoid gag and novelty gifts. Also don’t forget about stress, anxiety and other mental health issues. People going through an emotionally traumatic time appreciate get well gifts, too. The occasion can be as simple as a co-worker dealing with a stressful time at work or a much more devastating issue for a friend such as a loss in their family. Illnesses and injuries with long recovery times are often pretty boring. When someone is waiting to heal, they’re often limited in how they can move and where they can go. If the person is expected to be housebound or even bedbound for a long time, try sending activity-based gifts such as puzzle books, coloring books and so on. Avoid anything too complex. Between the illness and any medications, most of us aren’t at our sharpest while recovering. Simple puzzles and games are often fun without becoming frustrating. When Should I Deliver the Gift? If the injury or illness was sudden and unexpected, try to reach out with a gift as soon as you can. This is especially true if the intended recipient is undergoing surgery. Nothing lifts the spirits quicker than waking up after surgery to a room filled with get well gifts. Consider the size of any gift. While a gigantic novelty stuffed animal might seem cheerful, remember that the person will have to move it and eventually store it somewhere. Leaving the hospital is stressful enough without having to worry about transporting a bunch of large, unwieldy items. Many get well gifts are edible. Candy and cookies are always a tasty treat, especially if the recipient has been eating nothing but hospital food for a while. Plus, edible get well gifts have another advantage. Once eaten, there’s nothing left to store or carry around. There is one important exception to edible gifts. Most people don’t really want to eat a lot of candy and cookies if they’re unable to move around normally. Unintended weight gain is often a serious problem during illness or injury recovery. A calorie-dense get well gift might not always be the best idea. Injury or illness can take a harsh toll on your emotions, too. Receiving a get well gift can be a great boost to your psyche. After all, it’s a clear, visible way to understand that your friends, co-workers and loved ones care about you and wish you a speedy recovery. Research from the Mayo Clinic shows that people with an extensive emotional support network often have a quicker recovery from serious illnesses. Unfortunately, visiting someone at home or in the hospital can often be logistically difficult. But sending a small gift can often have the same effect as visiting in-person! Get well gifts are also a helpful way to welcome back a co-worker who has been away due to sickness. Returning to work after an extended absence can often feel awkward. A desk filled with get well gifts helps reassure the person that the whole office is rooting for them. We all experience health problems from time to time. If a friend or loved one is feeling under the weather, a get well gift can often play an important role in recovery. So, don’t worry too much about picking the absolutely perfect gift. Simply sending any small reminder that you care about their well-being will be appreciated. Of course, the more personalized and useful the gift is, the more it’ll be loved. Use our gift guide above to find the perfect get well gift for your specific situation. The road to recovery is often much easier traveled when you have friends and loved ones at your side.